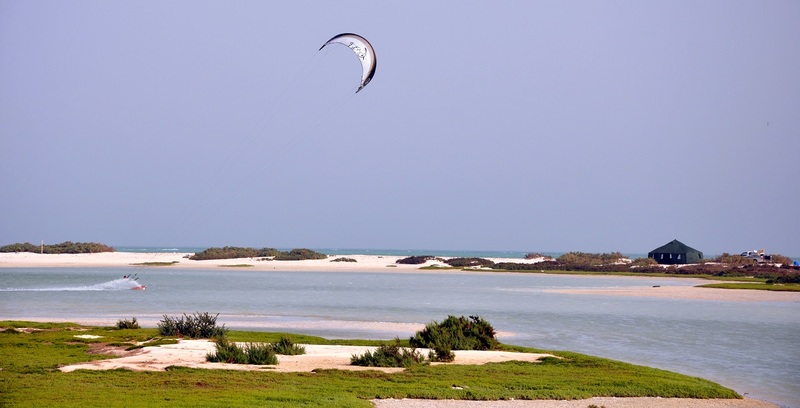 The peninsula in the Gulf of Masirah , north of Duqm, hides Oman’s best flat water lagoon which provide perfect conditions and diverse Spots for kitesurfers. A powerful 4×4 is necessary and we recommend a guided tour as the environment can become dangerous for inexperienced drivers. The turquoise lagoons which are surrounded by fine white coral sand are separated from the open sea by narrow sandbars. The water remains super shallow even in a heavy wind beyond 40 knots – real dream conditions in knee- to waist-deep water. The lagoons have one or two narrow entrances to the open sea. Thus they not only provide natural protection for local fishermen with their small boats who appreciate calm flatwater as well. The Bar Al Hickman / al Khaluf area is perfectly suitable for flat water lovers. The three main lagoons are situated within 30 km and in addition there are several protected points – more than enough variety for a one week stay in that area. The juts of the peninsula Bar al Hickman point out into the open sea. It is the first place to be hit by the Monsoon of the Indian Ocean. So the wind are very constant and without turbulences. Temperatures are super comfortable even in summer as the sea breeze could not heat up over land up to that point. The lagoons are narrow and 3-5 km long. Of course, you can make trips to the open sea beyond the sandbank at any time. From Bar al Hickman you can visit the white “Sugar-Dunes” of Al Khaluf . The snow-white dunes fall into the bright blue sea and offer a breathtaking view while experiencing the best sideshore conditions in deep water. At the head of the bay you will find the only wavespot in that area which builds up with offshore wind behind a point . The direct off-road route from Bar al Hickman to al Khaluf is impressive, but even with a powerful SUV not always passable and definitely not for off-road beginners. We really recommend booking a guided trip to get there! Be careful as the peninsula is “Sabkha” region. The boundaries between land and sea are blurred there over kilometers, depending on the tides. Areas that were easy to cross one day, are silted up the next day or impassable because of quicksand for several days even with a powerful 4×4. The idyll of solitude can be life-threatening in the total seclusion of a desert country in such a case . We STRONGLY recommend to avoid trips on your own in that region and to join our guided tours with experienced guides. They know the area well and know how to avoid a critical situation or how to act in the event of that. Bar al Hickman can only be approached at specific weeks of the month, depending on the tide. 2016 we offer two limited pioneer trips in Oman, one in the time period from 26.6. to 2.7. to Bar al Hickman / Al Khaluf in the Sharqiyyah region. We are happy to arrange journeys for your own group, depending on the number of participants and the local tides. Just get in touch with us!